How do these horror stories about removing stitches come about then? What is the situation if the patient who needs stitch removal is a child? It is often said that removing stitches is a painful affair. For most of the cases this is not a true statement. A proper healing wound allows for stitch removal without any noteworthy pain as long as the patient does not move around and does not tense up the area in which the stitches are located. Some of these tales go all the way back to the post-war period. Back then they used completely different stitching material than today. The removal of these materials indeed used to be a painful matter. The image shows sutures after performed surgery on an advanced Dupuytren condition. Additionally in this case a large skin transplant (full thickness skin-transplant) was required. Even this fairly large number of sutures can be removed without too much distress for the patient. 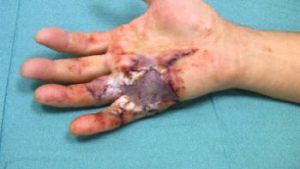 However the large amount of suture and the sensitive areas of the skin transplant in the above mentioned example represent a certain difficulty. Such difficulty may be alleviated by removing the stitches over several days in a case like this. A small number of stitches may easily be removed even from toddlers as long as the children can be distracted. The pain is very limited if the wound is healing properly. Removing larger numbers of stitches however becomes more difficult in children, especially if the affected area is also encrusted. The image shows such a situation on the example of a syndactyly correction procedure. In cases as shown in this image, sedation or even a short anaesthesia may become necessary in order to remove the stitches.